Johnny learned early. If somebody asked him why he was so different, why he held himself so still and why his eyes seemed to swallow light, that's what he'd tell them. He learned early that there was no safe place, not the backyard or the playground, not the front porch or the quiet road that grazed the edge of town. no safe place, and no one to protect you. Let me say upfront that I was not too enthusiastic about reading this book. I had seen mention of it before, but my interest wasn't stirred. My boss, however, insisted I read it, saying she couldn't put it down, forgoing the necessary chores she was supposed to do. So, with her copy in hand, two months later, I finally opened the book and began reading. I nearly put it down after the first forty-nine pages. Not because it wasn't good, but because I just wasn't in the mood. And it seemed a bit predictable. But then, on page 50, I was hooked and there was no going back. Johnny Merrimon is a fourteen year old boy whose world was irrevocably changed when his twin sister disappeared the year before. His parents' marriage fell apart, his father took off, his mother turned to drugs to numb her pain, and his mother's new boyfriend, a well-to-do and respected man in the community turned out to be a monster behind closed doors. Johnny, with a child's innocence, believes that he can make things right by finding his sister, and so, carefully and methodically, he sets out to do just that. His pain is raw, his courage unfailing. I fell in love with Johnny's character from the first moment. Even as I wanted to protect him, I cheered him on. Homicide Detective Clyde Hunt is obsessed with the disappearance of Alyssa. It is a case he was unable to solve, and he feels a strong attachment to the Merrimon family. I was reminded of the private detective from Emily St. John Mandel's Last Night in Montreal in the way Hunt neglected his family in his obsession to find out what happened to Alyssa. Hunt's son is struggling with his own demons and could really use a father, but Hunt has little time for him. He's more worried about Johnny and his mother. I am not sure how much more to say about the plot, only that it is complex and takes many turns, some unexpected and some more predictable. Regardless, the intensity of the events that come is high. John Hart knows how to draw the reader in and make her hold on for dear life. In part, that comes from his creation of such layered characters. Johnny's mother is oblivious to her son's wanderings and efforts to find his sister. She witnesses him being beaten at the hands of her boyfriend, but does nothing to defend him--she cannot even defend herself. Domestic violence and child abuse are two prevalent problems in our society today, often hidden behind closed doors. I cannot even imagine what it must have been like for Johnny's mother. One minute married to a wonderful man with two children and happy. To suddenly have that ripped away from you . . . I wanted to wring her neck for neglecting her son, the only person she still had left. But I also could understand a little. We see it all too often, the weight of grief and loss, the toll it takes on a person can be overwhelming. It doesn't make it right, of course, but I can see how it could happen. Johnny has had a hard life since his sister disappeared. He turned to God for help but felt that got him nowhere. And yet he did not lose faith, not completely. He just began to look elsewhere for answers. His determination and resolve is admirable but also frightening. I wanted so much to give him back some of that innocence he lost. Then there is Johnny's friend Jack, Levi Freemantle, Detective Yoakum, and others whose stories intertwine with Johnny's. All of the characters have their part to play, even if in the smallest of ways. The Last Child is dark and at times ugly. John Hart pulled no punches when painting the ugliest side of humankind. Even in that, however, he also demonstrated the best side of humanity: the hope, resilience, strength and love. 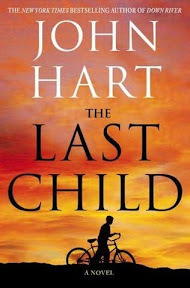 I am glad I decided to read The Last Child after all, even despite my initial reservations. I would have missed out on a great book, one that kept me up late into the night. You can learn more about John Hart and his books on his website. Source: My boss twisted my arm to read this book. It was a copy she bought for her own personal use, which she then loaned me. I love books that manage to portray both people at their best and people at their worst. Live is a mix of both, after all. Man oh man! I have this sitting on my shelves! Now I want to read it immediately. I guess I knew it was good, plus it just won the Edgar. I'm going to have to pull it out and put it on the short stack. Nice review! WOW! This sounds great! Thanks for the review. This one was already on my radar screen and now your review solidifies its place on my TBR. It sounds like a great read and one that will stir a lot of emotions in me as I read it. Oh my! This does indeed sound like a really suspenseful and interesting read. In hadn't yet heard of it, but after reading your review I am very intrigued. Thanks for sharing this wonderful review. I will be adding this book to my wish list! I keep seeing good reports on this one, and actually came close to buying it a few weeks ago. Next time, I may give in. Great review, Wendy - and a great argument for sticking with a book past the first 50 pages! SOunds like a great thriller Wendy! I have the audio version on my iPOD. Great review. I'm glad to hear the book turned around for you soon. This one wasn't really on my radar either but after we decided to read it for mystery book group I'm looking forward to it. It sounds like there will be quite a bit of stuff for us to discuss so that's great! Great review, Wendy! I don't mind dark and ugly as long as it's well written. This ones sounds like it has a bit of everything going for it! Melody - Thank you. It was a good book. I hope to read more by the author down the road. Ana - I do too. It makes the reading experience so much richer. Sandy - I hope you do read it soon. I'd love to read your thoughts on it. Kathleen - It was an emotional read--so well done! Heather - Although it got off to a slow start, once it picked up, it really took off. Diane - I hope you enjoy the audio. Hopefully it will be just as good read that way. Iliana - Crime fiction isn't always the best for book club discussions, but as you said, this one definitely covers a lot of issues worth talking about. Staci - I'm the same way, Staci. I like books that are on the dark side often times. Good writing goes a long way. Christine - I hope you will enjoy it if you do read it, Christine!